Le Jour was a French distributor best known in Europe as a retailer of chronographs manufactured by Heuer (Le Jour was also the name Yema used to bring watches into the States). Heuer, it should be noted, produced watches for a number of brands under private label arrangements. Many of these watches were identical to those already in Heuer’s catalog, just without Heuer’s branding. Around the ’80s, Heuer made a PVD-cased sports chronograph called the Pasadena. Heuer also made this watch for Le Jour, who debuted it as their 7203 chronograph. This watch, like so many others produced by Heuer for third-parties, is often referred to as a poor man’s Heuer amongst collectors. Le Jour eventually went the way of so many other brands that perished during the height of the quartz crisis. The rights to the brand were bought and sold numerous times, with no major attempt to revive the brand in a meaningful way. That is, until now. Introducing the Le Jour Mark I 001 chronograph, just one of the watches in Le Jour’s debut collection. We recently discovered that Le Jour is indeed back, and the brand is kicking things off in a strong way with an inaugural collection of seven barrel-cased chronographs dubbed the Mark I. The Mark I is not a one-for-one remake of the aforementioned 7203, but rather what one might call a spiritual successor. Now, I’m a total sucker for barrel-cased chronographs, and I own more than my fair share of them. On paper, the Mark I looks really good and the price point—starting at $2,000 for the most basic models—is too tempting to ignore. I knew that this was one I had to check out in the metal, so we get one in for review. But did it hold up to closer scrutiny? Let’s find out. The case measures 42.5mm wide, 46.3mm lug-to-lug, and 16mm thick. It’s a watch not without presence, but the tempered length of the case makes for a very wearable timepiece. That said, it is a hefty watch, weighing in at 218 grams on the accompanying bracelet (that is, with none of the links removed). 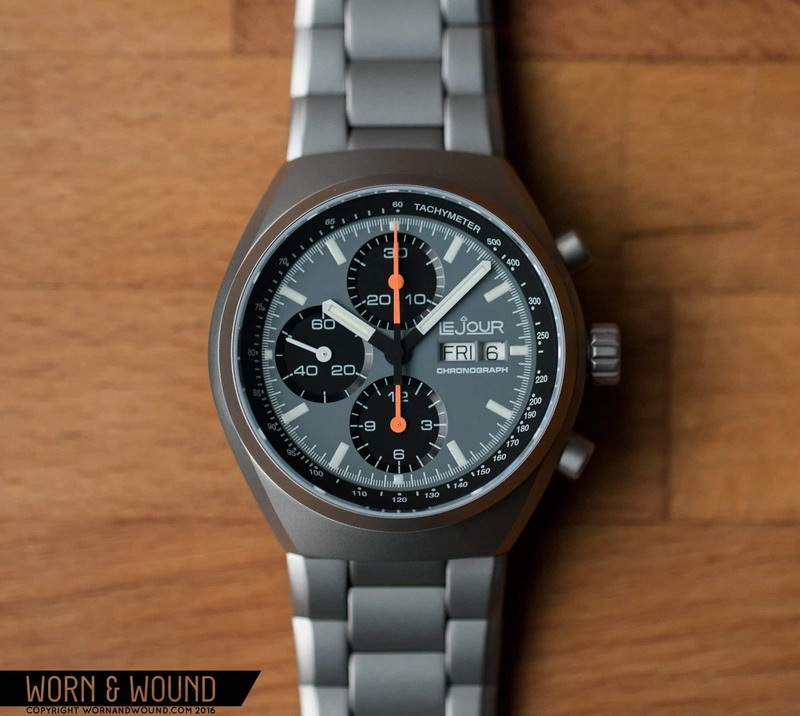 So, there’s quite a bit of steel here, but as someone who has handled plenty of other steel, barrel-cased chronographs—both new and vintage—the bulk here isn’t out of place. Still, a titanium case might be something for the brand to consider going forward. The case is segmented in a number of ways to diminish the visual impact of the height. In terms of the design and architecture, the case of the Mark I is very well executed. The case consists of three separate parts: the bezel, the mid-case, and the case back. The case is segmented in a number of ways to diminish the visual impact of the height. For example, though it’s quite tall, the bezel features a bevel that cuts some of that height down. The same idea is carried over to the mid-case, which features two sets of bevels running down the length of the case both at the top and at the bottom. Without these, the case would appear far too slab-sided. With them, you have a far more interesting profile. With regard to case finishing, Le Jour’s current lineup has a nice array of options should you want something different from the matte, bead-blasted example I have here. The 003 and 004, for example, both feature a matte black PVD finish that gives the watch a sporty, aggressive look. My favorite finish, however, is found on the 005, 006 and 007, where the case boasts a stunning mix of high-polished and brushed surfaces. I especially love the way this looks on the mid-case, with the top of the case featuring beautiful sunburst brushing that is offset by the highly polished bevels and bezel. Along the right side of the case you’ll find a signed screw-down crown flanked by two pushers. If I were to find a single fault with the watch, it’s that the crown has a bit of play when undone and pulled out to the time-setting position. It’s a personal pet peeve of mine that probably wouldn’t bother most people, but one worth noting. The pushers, on the other hand, feel very solid and have a satisfying click when you engage the chronograph function. Flipping the watch over, you have a relatively straight forward case back. In the center, you’ll find the stamped Le Jour logo, and running along the perimeter of the case back are some of the watch specs. Turning to the dial, we’re presented with a familiar formula. Sub-dials at six, nine and 12, along with a day/date at three, hint at the Valjoux 7750 engine within. The execution here, however, is a bit more exciting than just that. First, the dial has a sandwich construction. The sub-dials aren’t printed on the surface of the dial. Instead, they sit on matte black plate below the main dial and can be seen through cut-outs. This gives each register a bit more depth. Then, to further accentuate that depth, there’s a high-gloss, angled ring around each cut-out. Overall, this level of detailing gives the dial a bit more dimensionality. The only downside to this sort of layered construction is that the dial sits further off the day/date wheels, resulting in a deeper-set aperture. That said, I noticed no impact on legibility. The deeper-set sub-dials give the dial some welcome dimensionality. The dial then is a light gray with black sub-dials. The primary index consists of large, lumed rectangles for every hour position, with smaller lines for every second, and even smaller lines between those for every 1/5th of a second. A black chapter ring features a printed tachymeter scale. The Le Jour branding and the word “chronograph” sit above and below, respectively, the day/date windows at three. The hour and minute hands are two classic swords, bordered in white and lume-filled at the center. The bases of both of these hands are black, beginning about 1/3rd of the way down and to the center. The running-second hand, found in the sub-dial at nine, is a white stick. Then, for a bit of color-coded contrast, the hands associated with the chronograph function are a slightly pale orange. The primary chronograph second-hand is a tapering needle, also with a black base, while the two remaining hands found on the sub-dials at 12 and six are orange sticks. Le Jour is not the first to color-code the chronograph function like this, but it’s always a welcome feature and one that aids in readability. In terms of dial options, Le Jour is currently offering seven variations on a theme, from a classic panda dial to an intense-looking meteorite dial. As I wrote above, the engine powering the Le Jour Mark I chronograph is the venerable Valjoux 7750. It’s an industry workhorse, and one that I am sure many of you are already familiar with. For those who aren’t, I’ll just say that it is a reliable, time-tested movement that promises many years of faithful service. And once again, the action on the pushers here is really crisp, so the watch will be a joy to operate. The Mark I comes on a solid, three-link bracelet. At the lugs, the bracelet is 22mm. Then, the first set of links jumps up to nearly 25mm, matching the width of the case. the bracelet then tapers down to 18mm at the clasp. I really like this execution as it creates an almost seamless transition from the case down to the bracelet. This effect is further emphasized by the detailing along the outer links, which are stepped to match the bevels along the sides of the case. Note the transition from the case down to the bracelet, aided by the bevels on the former and the stepped detailing on the latter. The signed clasp is robust and features two safety buttons. The Mark I on a 7-inch wrist. As I wrote above, the Mark I is not a light watch. But the head alone is only 111 grams, which means that the bracelet is responsible for nearly half of the weight. On a leather strap or a nylon one-piece, you get the watch down to a totally reasonable range. That said, I did not find this watch at all uncomfortable to wear, and it does wear well. The launch of the Mark I series from Le Jour is, in my opinion, one hell of a way to bring a brand back from the dead. And even without the pedigree, this is simply a solid watch that stands on its own. It has a great aesthetic that, while familiar and rooted in history, is also made to feel fresh via a handful of carefully selected details.